With a new fashion blog launching seemingly every minute, there are more and more bloggers competing to influence your next outfit every day. But as you might have noticed, not all outfit posts are created equal. 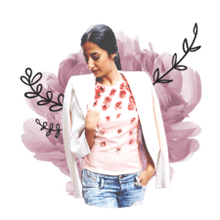 Searching for online fashion inspiration, it's not hard to fall into a rabbit hole of blogs, ending up wasting hours online, still with no real sense of what you should wear. That's why we've rounded up our favorite fashion bloggers, who stand out from the online pack thanks to their impeccable style sense, creativity, and individuality. For the best fashion advice out there, allow yourself to be influenced by the outfit posts by these fashion bloggers. "Fashion Jackson" is the stylish creation of Dallas fashionista Amy Jackson, who launched her site as a sideline to her corporate career, and quickly turned it into a thriving business. Amy's signature style is sophisticated but comfortable, with a little edge mixed in. A look through her daily outfit inspiration photography shows Amy typically wearing chic, streamlined street style ensembles, including skinny jeans, jumpsuits, and slim pants, layered smartly with blazers or leather jackets, and worn with sneakers. Fashion Jackson has been featured in WhoWhatWear, Elle, StyleCaster, has appeared in campaigns with Banana Republic, and worked with brands including Nordstrom, Neiman Marcus, Ann Taylor, and many more. Born and raised New Yorker and Brooklynite Helena Glazer Hodne is a graduate of New York's famous FIT fashion school. She launched her personal fashion blog "Brooklyn Blonde" in 2010, and today has nearly half a million Instagram followers. Her site typically shares a day in Helena's life, focusing on her passion for fashion, but also including interior design, beauty products, and being a mom to a cute son. Helena's daily outfit photographs show her dressed in gorgeous designer outfits on the streets of New York City. She has become known for her authenticity, and forms a strong bond with her followers through daily interactions and chats. German fashion blogger Gitta Banko is a lifetime fashion enthusiast who has been a model, boutique owner, and clothing designer. She expresses her love for fashion on her popular "Blondwalk" fashion blog, where she shares her daily looks and fashion inspirations, and ideas for how to combine items in new ways. Gitta's signature style is eclectic, and her outfits can range from simple and elegant, to wildly experimental. Look to her site for high quality fashion photography of Gitta wearing fabulous outfits on the streets of Dusseldorf, and on her trips to fashion capitals of the world. "The Fashion Guitar" is the online style diary of Dutch-born, New York City-based blogger Charlotte Groeneveld-Van Haren. Charlotte's quirky, feminine style often involves pairing romantic fashions with classic wardrobe essentials. More often than not, her daily outfits involve statement dresses, cool skirts and patterns and prints aplenty. Her blog is a go-to destination for fashion lovers seeking inspiration for a fun take on the prettiest trends.